Paradise hit the jackpot during the latest storm cycle, with 67" of new powder in 4 days through Saturday morning, topped by another 6" during Saturday and Sunday. All of it fell with about 5% density, with only 3.8" of precip recorded for the 73" of snow. The snowdepth at the Paradise snow stake reached 252" on Saturday, the deepest reading since 1999 when it topped out at 290" on March 30. The Park Service had the wisdom and foresight to keep the road from Longmire to Paradise closed on both Saturday and Sunday, citing heavy snowfall and high avalanche hazard, thus keeping the pow nicely untracked while I was preoccupied with attending a friend's wedding. If the road would just open, Monday would be EPIC! The forecast called for partly sunny, 1000 ft freezing level, with a chance of afternoon snow showers. 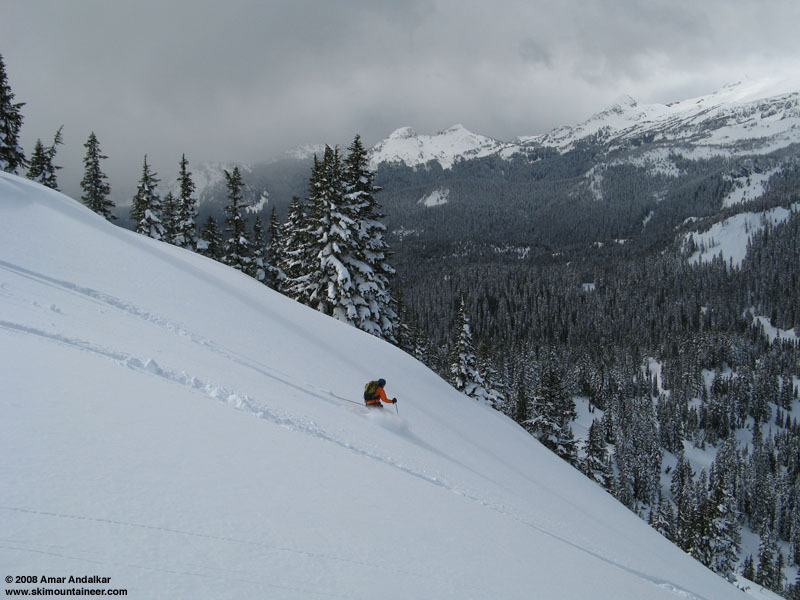 Coupled with Sunday's reports from other locations of a crust on sun-exposed slopes, it seemed like the north-facing slopes of the Tatoosh Range would hold the best quality powder. Hannah and Dave joined me for the unexpectedly treacherous drive to Rainier, with an inch of new snow on the road starting just south of Eatonville (about 1000 ft) and continuing all the way into the park. The phone recording said the Longmire gate would open by 9am, but upon reaching the park entrance the ranger said it was still closed. Nevertheless, we went through the open gate at 9:15am without any delay, notwithstanding a brief spinning encounter with a snowbank about a mile earlier. The drive to Narada Falls took forever at 15-20 mph on the slick and icy surface. Following a brief parking lot lecture on the severe avalanche hazard delivered by a well-meaning couple of snowshoers, we broke trail up through the woods behind the Narada Falls garage (4600 ft) in deep, unconsolidated powder. 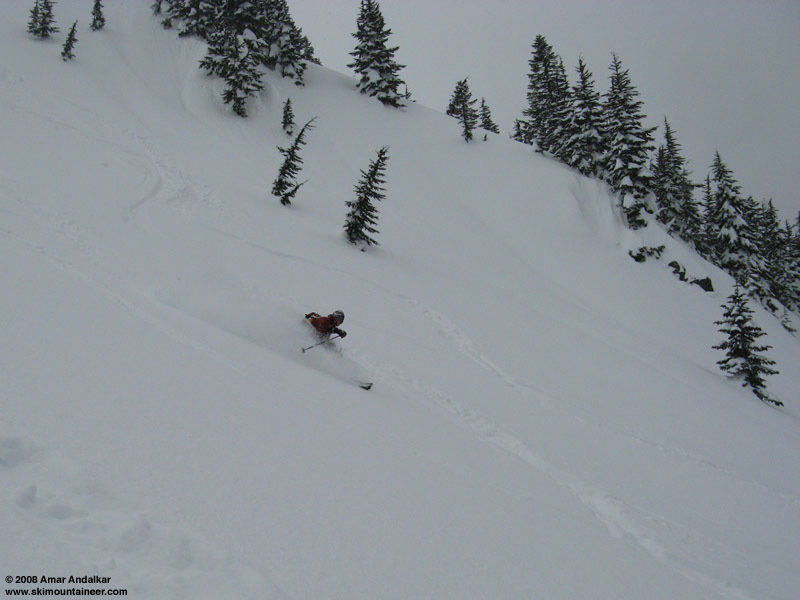 The official NWAC forecast predicted "MODERATE avalanche danger below 7000 feet except increasing and becoming locally CONSIDERABLE on steep mainly sun exposed terrain and steep slopes near ridges late morning and afternoon." 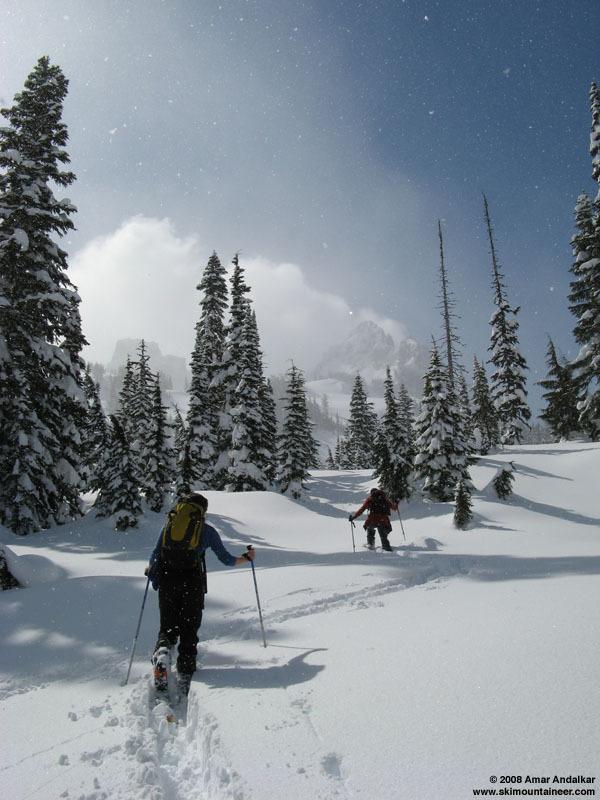 Despite the non-threatening forecast, in light of the copious recent snowfall we decided to follow the very well-signed and well-poled winter trail, avoiding the slightly shorter but much more avy-exposed route following Stevens Canyon Road. The trail crosses the bottom end of Mazama Ridge at 5100 ft, before dropping gently to reach Reflection Lakes at 4900 ft.
Dave and Hannah breaking trail below The Castle and Pinnacle Peak. A few welcome sunbreaks at the Lakes allowed us to scout a safe route towards the 6200 ft Pinnacle-Castle Saddle, following a gentler wooded ridge up through the otherwise steeper slopes. Breaking trail the whole way was somewhat arduous, with ski penetration of about 10-15" and pole penetration of 30-40" in most spots. Dave handled the lion's share of the trail breaking (thanks! ), with Hannah and I splitting the rest. We skinned up to the terminal moraine of the (erstwhile?) Pinnacle Glacier and continued to the saddle, with the nice powder of lower elevations transitioning as expected into denser wind-packed powder on these open slopes above treeline. Despite the 6 ft of recent snow, winds were quite light throughout the storm cycle, limiting the possibility of dangerous windslab formation, and we found nothing which I'd call a windslab. We considered digging a snow pit, but chose not to. Wind-packed powder below the saddle. The snow skied OK up high, and we enjoyed an early season schuss across the deeply-buried Slush Cup Pond. The snow quickly transitioned to beautiful powder below 6000 ft as the protection from wind and sun increased. Having seen no signs of instability, we cautiously skied the steeper slopes and rolls leading to the flats below. The powder was deep and cohesionless, with only a few minor sluffs of the top 2-4" of lightest snow as we sailed down the 30-40 degree slopes. Hannah rippin' it up, with Iron Mtn, Copper Mtn, and Pyramid Peak in the distance. We rejoined our skin track around 5100 ft and headed back up, grateful to finally not be breaking trail. The weather had been improving throughout the day, with nice warm sunshine and a few glimpses of the summit of Rainier above the lingering clouds. At 2:13pm there was a brief glimpse of most of the mountain through the distant mists, but it lasted only a minute and was not to return. We soon met the only other skiers we would see all day, a couple (including John, a TAY lurker) who had followed our skin track from Narada. For the second run we skied from the 6240 ft knob east of The Castle, enjoying even nicer powder on the protected slopes below the Castle, before dropping less cautiously down the steep rolls below. Fantastic! Waist-shots only most of the time, except for Dave who enjoyed (?) several head-first plunges into the snow. By now it was 3:30pm, and the weather was turning as forecast, with thickening clouds and increasing snow showers. But the snow was so good that we had to do a third run, heading up only to 5900 ft at the head of the steep slopes and enjoying another blast of pow. Happy skiers before the final run. Skiing down to the Lakes, we decided to take Stevens Canyon Road on the way back, since the snow stability had been excellent all day. Some more tedious trail breaking (often in denser, crustier snow) brought us a mile down the road, safely past the steep avalanche slope to reach Inspiration Point, the head of the steep slope above the Narada garage. Not knowing quite what to expect (and fearing some bad crusty snow here), we cautiously traversed across the top of the entire slope to the edge of the forest at skier's right.� Pointing the skis downhill, we found with relief that the slope held another nice (but short) shot of sweet and stable powder. A perfect finale to a great day! Face shots (?) on the Narada slope. Great TR, Amar -- nice work. That's a lot of trailbreaking. Glad you reaped the rewards. I wouldn't exactly say you "split the rest" with Hannah. We're talking about "Ms. Rainier-regular" here. Dave, I was feeling a little sorry for you on Sunday because you had to work while I got to be lazy and nurse my sore muscles from Vertfest. Imagine my feelings as I sit at work today, pondering the blue skies outside and the fluffy powder on screen. The three of you better save me a seat for your next trip to MRNP!